The Polish government signed a $4.75 billion missile defense deal with the United States, which is Poland’s largest defense deal in nearly three decades. Aside from the security obligations discussed, countries seeking to join the Visa Waiver Program must have a visa refusal rate of less than 3 percent. Increased emphasis should be placed on a country’s visa overstay rate (objectively determined by the number of a country’s visitors who overstay their visas). The Polish government signed a $4.75 billion missile defense deal with the United States on Wednesday, which is Poland’s largest defense deal in nearly three decades. This move reveals the threat Russia poses to Eastern Europe as well as Poland’s desire to cooperate with the U.S.
Just as Poland reached out to the U.S., Washington should strive to enhance its relationship with its Central and Eastern European allies. One effective tool the U.S. can use is the Visa Waiver Program, which enables the citizens of participating countries to travel to the U.S. for up to 90 days without a visa. The program provides many benefits for the U.S., including economic, diplomatic, and security advantages. Because of this, Congress and the Trump administration should look to expand it. Currently, 38 countries are a part of the Visa Waiver Program. However, Poland and other NATO allies—such as Croatia—have been kept out, despite their desire to join. To become a Visa Waiver Program member, a country must share terror-related intelligence with the U.S., exchange biographic, biometric, and criminal data with the U.S., notify the U.S. about lost or stolen passports, and increase security within its own airports. The Visa Waiver Program has been an invaluable tool for the U.S. in its fight against terrorism and international crime. Therefore, a judicious expansion of the program will increase the resources the U.S. has to enhance security. Unfortunately, the program has slowly expanded since 2008. While Croatia and Poland already meet all or most of the program’s information-sharing requirements, these countries have been excluded because of their visa refusal rates. As of 2017, Croatia and Poland had visa refusal rates of 5.1 percent and 5.9 percent, respectively. 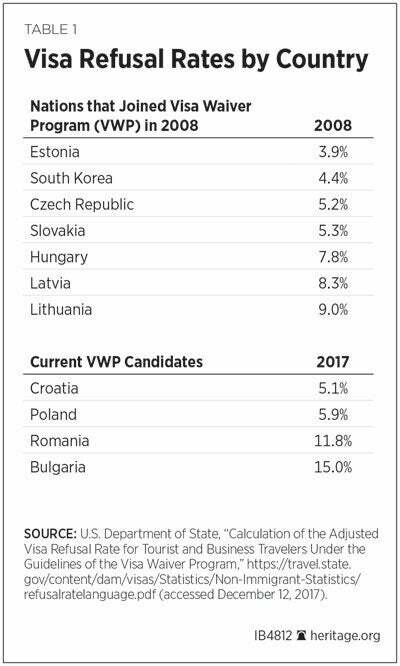 As can be seen in the graphic below, none of the countries admitted into the program in 2008 had rates below 3 percent at that time. Rates of up to 10 percent were accepted. The high amount of weight given to a country’s visa refusal rate is a problem. Refusal rates are subjective as they are based solely on the judgements of consular officers. When the visa overstay metric is used, the 2016 rates of Croatia and Poland fall among the rates of six of the countries admitted in 2008. 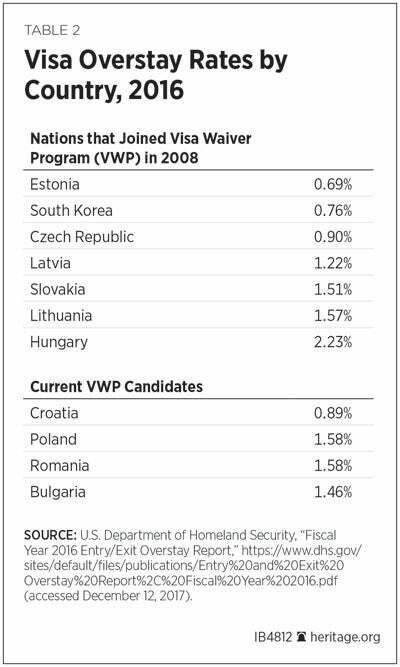 The Visa Waiver Program’s requirements should be updated to raise the visa refusal rate to 10 percent and place strong consideration on an applicant country’s visa overstay rate, thereby allowing Croatia and Poland to join the program. In an era of Russian aggression, it’s in America’s interest to strengthen ties with its European partners. Expanding the Visa Waiver Program would do just that.